The Faculty Lounge: Are Pitbulls the Black People of Dogs? Are Pitbulls the Black People of Dogs? The internet is a-chatter with criticisms and support of Breed Specific Legislation (BSL). A simple Google search for “pit bull” brings up countless articles, blogs, videos, and posts of reports of pitbulls mauling children, pitbulls jumping fences, pitbulls with muzzles, and pitbulls locking jaws. Enthusiasts from the other side recall pitbulls joyfully licking feet, pitbulls snuggling with infants, and pitbulls seeking belly rubs. The diversity of experiences and interactions with this breed demonstrates the wide variety of animal personalities, while suggesting that the aggressive reputation of pitbulls has little to do with innate and immutable characteristics. Rather, as many owners and activists argue, it is the aggressive treatment of the animal that unleashes the bad and dangerous behavior. Under this logic, a quorum of Alpha Pomeranians with incidents of biting, mauling, and lunging could generate similar ire and fear, transforming the reputation of the dog from Toy Breed to Fighting Breed. Opponents to the ordinance challenged its constitutionality by invoking both due process and equal protection claims. The Supreme Court of Colorado rejected these challenges, employing a rational basis standard of review. The Court argued that pitbull owners, as a class, did not exhibit the same characteristics of a constitutionally protected class deserving of heightened scrutiny, such as race, origin, or gender. States, in the interest of providing safety for citizens, had a legitimate state interest in the regulation of pitbulls. My initial reaction to these laws is the utter disbelief in determining the correct breed of any dog without certifiable papers. As the former owner and friend of Remley (R.I. P. 2/21/06, pictured above, languishing in the grass) a pit mix that I adopted when she was thirteen years old, arthritic and diapered, I cannot help but wonder how a state agency would accurately determine her breed. She kind of looked like a pit, but she acted like a tub of margarine. I rescued her from the New York ASPCA after she had been returned twice by other “adoptive” parents because of her illnesses. She had been initially abandoned in a garage in Brooklyn, chained to the wall, emaciated and unfed. Despite the pitifully sad circumstances of mistreatment, starvation, and abandonment in her earlier life, she was still just a regular dog. Objectively speaking, the best dog in the history of drool. But the rhetoric that surrounds the proponents of Breed Specific Legislation sounds remarkably racial. Consider the following common statements. Biology and breed unwaveringly determine behavioral characteristics. Reduced amounts of the aggressive ancestry decreases the chances for recidivism. 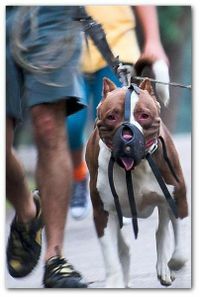 Pitbulls have large mouths and funny looking lips. It is wise to cross the street when approached by a pitbull. Pitbulls are lazy until you try to take something away from them. Mixed breed pitbulls are more intelligent, kind, and gentle than full-breeds. All pitbulls are from the ghetto. You can take the dog out of the ghetto but you can’t take the ghetto out of the dog. These statements could be equally applied to most any racially marginalized group, but most specifically, it invokes racially charged images of African Americans and Native Americans. The determination of who legally belongs in a racial group has long been the study of my own scholarly work, as well as that of Rose Villazor (SMU), Carla Pratt (Penn State), and Adrienne Davis (WashU). But could similar theories be extended to that of the animal kingdom? Not only are pitbulls more likely to be affiliated with “inner city” communities, but their behavior is reported at a dramatically higher rate than other breeds. Similar to the underreporting of whites committing drug crimes, rapes, and other violent crimes, dogs thought of as “good for children” (Beagles! Labs! Golden Retrievers!) are unlikely to generate the communal hatred so easily sparked by the independent action of a pitbull. Could it be that far off the mark to question the standard of review for owners of pitbulls? In all practicality, there is no chance that certain animal owners will become a protected class of people. Yet, with the similar rhetoric, invectives, criticisms, and stereotypes, could regulation of pitbull ownership reify the racial identity tribunals of the nineteenth century? With the current debate over the applicability of some sort of Bell Curve for animals, could it be true that Pit Bulls are the Black People of Dogs? As a young intelligent black woman searching for a pitbull puppy to love I find your question so disturbing i won't even consider it bigotry. I would consider you to be largely uninformed and inherently ghetto. People like you are sad. THank you for reading the question. WHat do you think about the substance of the post? I don't believe she read the entire post... You asked the question in reference/comparison to the 19th century- showing that we don't use those ways anymore on anything else, why use them on this issue; and that if we were doing this with humans-characterising them by certain traits and such, it would be an outrage, so why do it with animals? What is the difference? (that was my understanding of the post, anyway. please correct me if i'm wrong) People that do not read things in the entirity, or take things out of context tend to bug me a little- and some people are just very defensive no matter what....but what can ya do right? Great post. Very fair and well written. Having not read the post itself and just taking the title out of context, Amber is obviously not as "intelligent" as she claims to be. Amber, having such strong opinions about a post that you haven't even read... that's awfully "ghetto" of you. Sad. I adore pitbulls like any other dogs. Kudos for this information here!